3 bedroom /2 bath cabin on the brow at Eagles Roost. Beautiful 2 story cedar house with a red tin roof, perfect for an afternoon rain shower. Built from local hardwoods, this is an authentic mountain home with all the charm you would expect. Off a private road, you will find this getaway with ample den, buck stove and vaulted ceiling fully opening onto huge deck. Open the doors and this space turns your den and deck into one room. . . an indoor /outdoor living area. The deck features an 8 person hot tub , comfortable outdoor den furniture including a sofa, love seat, chair and ottoman surrounding your slate coffee table/ gas fire pit adjacent to a large teak dining table and umbrella and charcoal Weber grill. In the center of the deck is a bar "overlook" that enhances the vast view of the valley and distant mountains. A small screen porch is adjacent to the dining room. Just open the double doors for al fresco dining. The next time you see an ad for Lookout Mountain vacations you will swear the pictures were taken from this very deck. Large master with king bed downstairs,700+ count sheets, down comforters and pillows, private bath and private large jetted tub. 2 upstairs guest rooms. Queen bed in 2nd guest room and queen bed in 3rd room; both share 2nd bath with private entry from 2nd bedroom. 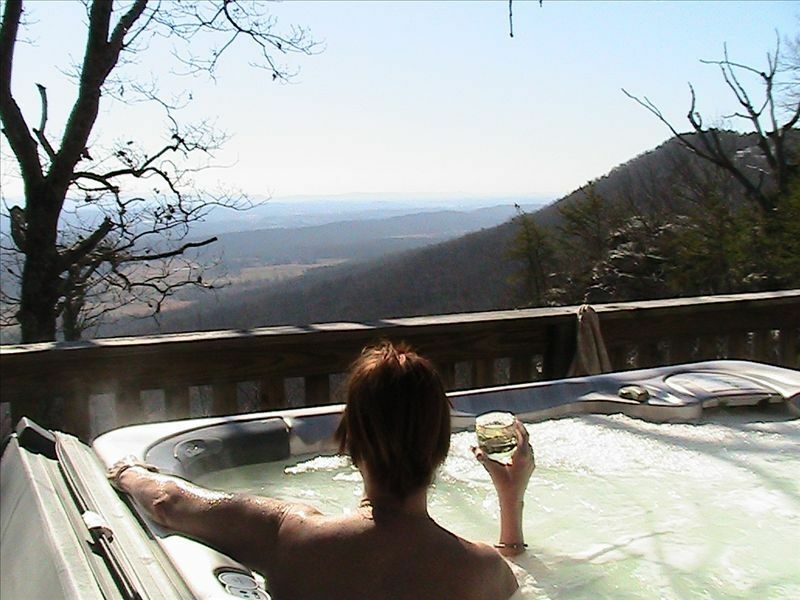 Although there is lots to do around Ridgetop, many people get there and just stay to enjoy the view and privacy! I bought this home as my 2nd home years ago and while living in Atlanta routinely made trips to Ridgetop on weekends. We loved it and furnished the house with antiques, art and cabin style features. Since then, I moved to Florida and decided to let others enjoy the home as much as we have. I try to get up to Ridgetop once a year and while I am away we have a fantastic couple who take care of the property and are there for our guests anytime they are needed. The view, the view, the view! That's why I originally bought Ridgetop but then I discovered other wonderful things about the home and the area. The house is very secluded with just a handful of homes on the road. Every season is wonderful, although Fall is probably my favorite. Sitting outside, enjoying the colors, and reading a book in front of the gas fire pit is hard to beat. I know you will love Ridgetop as much as I do. Enjoy the view, the oversized hot tub, barbecuing outside, the buckstove that heats the entire house, the walk down the quaint dirt road in front of the house. Sit at the outdoor bar that makes you feel as if you are soaring over Shinbone Valley below. You cannot help but feel at peace and relaxed while visiting Ridgetop. Mentone is a quaint village just across the AL line, 8 miles from Ridgetop. Antiques, shopping, diners. One of the few properties on the GA brow for rent. Spectacular views and lots of Fall color. Beautiful year round. Dine inside or outside while enjoying the view. Tons of movie dvds and vcr tapes! 8 person hot tub overlooking the valley. We celebrated our daughters birthday here. She had such a great time The house and view was beautiful. The owner was great and easy to communicate with. I stayed at Ridgetop with family, friends and our dog Lexa. It was a wonderful experience. The views are spectacular with rock cliffs on each side and what we estimated as a 60 mile view. The accommodations were extremely comfortable. The kitchen was very well stocked for preparing our meals. The bedrooms were well appointed with bedding and linens. The buck stove with the ample firewood provided by the owners completed the mountain cabin feel and warmed the whole cabin. A great vacation and the owners were kind and competent to deal with. Ridgetop delivers everything it promises and more. It’s a terrific destination. This was to be a relaxing vacation. In every way, Ridgetop provided that to us. The kitchen was fully equipped and, after a trip to Lucky’s grocery store in Menlo, we set to relaxing and, three times a day, cooking in Ridgetop’s excellent kitchen. In our week, we did not go out for a meal. We enjoyed our stay so much that we didn’t have a strong interest in going out to eat (with apologies to the several nice looking restaurants we passed along the way). We really just wanted to stay close to the house and relax. With the exception of some short trips out to Cloudland, Desoto and Little River, we did what we set out to do: relax. Ridgetop gave us exactly what we needed. The cabin was fantastic with the views and the hot tub being our favorite. It was well stocked with whatever we needed. It provided the peaceful, romantic getaway my husband and I were hoping for. We hope to return one day. My one recommendation would be to not arrive after dark for the first time. A little tricky to navigate to in the dark when you don’t know where your going. Also, while there is a local grocery, I was glad to have gotten what I needed beforehand as there isn’t a ton around. We REALLY enjoyed our stay and Julie was great in all of our communications and helping us navigate the area. Seven women in one cabin could have been claustrophobic, but this spacious rental had plenty of options for us to spread out. The description was misleading, though, as we never figured out how eight could comfortably sleep (in cold weather). Only other complaints are petty: slow coffee maker, only half of fire pit worked, the windows needed blinds, acoustics were not ideal, etc. Pluses include two ovens, lots of hot water in the showers, good wifi and cell service, beautiful views, and comfy tv viewing chairs. Would recommend for groups of six or less who all plans to wake up around the same time. Thank you for your review. Glad to hear you enjoyed the views. They are spectacular. Ridgetop is so private there is no need for blinds. The high vaulted ceilings affect the acoustics but don’t think anyone would trade the open roomy feel they provide over acoustics. We will check the fire pit but it was working properly last week. Our listing states that we can sleep 6 in queen and king beds and the reclining sofa is comfortable for 2 more. Many other guests with 8 have found it comfortable. Again thanks for the review. We loved our stay! The cabin is beautiful! The view is breathtaking. We loved the hot tub, back porch, and wood burning stove. The owners had every amenity and plenty of firewood! It was such a romantic getaway! Nearby world famous hang gliding school, festivals, antiques, gourmet cooking kitchen, movies. World's Longest Garage Sale in August! Holiday rates may vary at owner's discretion.